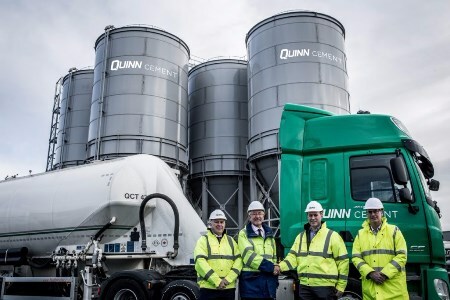 Quinn Cement has opened a new cement export hub at Warrenpoint Harbour in Co. Down, Northern Ireland. The new facility was commissioned at the end of January and officially opened on 8 February. The new terminal represents a £2.5 million investment by Quinn Cement and has an operations capacity of 7500 tph. It will be used exclusively for the export of bulk cement from the Quinn Cement operations in Ireland. Exports will be focused on the UK, where Quinn has also recently completed a £1.3 million upgrade to its import terminal in Rochester, Kent. “This is an important and timely development for the business ahead of Brexit,” said Dara O’Reilly, Chief Financial Officer of Quinn Cement’s parent company, Quinn Industrial Holdings.